Pastor Ivan Ibbotson first heard the call to the pastorate in 2006 while living in Maple Valley, Washington simply working as an Auto body mechanic. Ivan strongly felt the Lord’s calling on his life to do more to spread the good news of the Gospel. 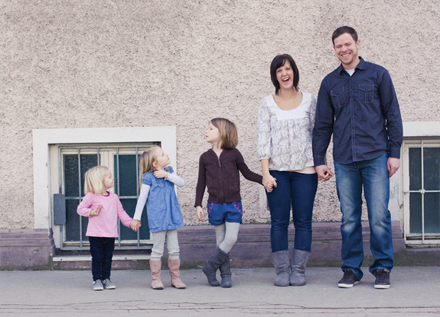 Leading a “normal life”, married to Michelle with a daughter and baby on the way, a house and two dogs, he felt the Lord prompting his heart to return to his old stomping grounds in Salzburg, Austria and plant a church. The Lord has His ways of revealing to us His plan for our lives, for Ivan it was through the Calvary Chapel Missions magazine, in the missionaries’ prayer requests section in the back of the magazine. The prayer request was asking prayer for a Bible believing church to be planted in Salzburg, Austria (a country steeped in tradition). Ivan himself having lived 12 years as a kid in Salzburg naturally had a deep burden for this city of his childhood. Through much prayer about a year and a half later he took the necessary steps to go forward in faith moving his family overseas. In July 2008 after the birth of his second daughter in May, Ivan and his family of 4 at the time said their goodbyes to family and friends and stepped out in faith on this adventure with the Lord.